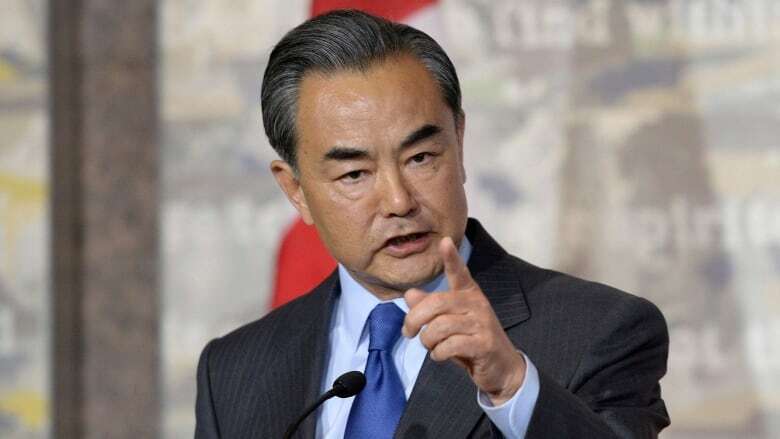 China's visiting foreign minister publicly berated a Canadian journalist on Wednesday for asking a question about his country's human rights record. Chinese Foreign Minister Wang Yi said it was "irresponsible" of a journalist from the web outlet iPolitics to ask about human rights and the jailing of a Canadian, Kevin Garratt, who is charged with espionage. "Your question is full of prejudice against China and arrogance ... I don't know where that comes from. This is totally unacceptable," Wang said through a translator. "Other people don't know better than the Chinese people about the human rights condition in China and it is the Chinese people who are in the best situation, in the best position to have a say about China's human rights situation," he continued. "So I would like to suggest to you that please don't ask questions in such an irresponsible manner. We welcome goodwill suggestions but we reject groundless or unwarranted accusations." The iPolitics question was agreed to by a number of journalists representing several news organizations at the event, including The Canadian Press. Wang asked the journalist if she'd ever been to China. "Do you know that China has lifted more than 600 million people out of poverty? And do you know the China is now the second-largest economy in the world from a very low foundation? ... And do you know China has written protection and promotion of human rights into our constitution?" Earlier, in response to the question that offended his counterpart, Dion said he raised Garratt's case with Wang and never misses an opportunity to raise human rights and difficult consular cases. Dion said he and Wang had "honest and frank conversations on human rights and consular affairs." "These discussions are central to a healthy relationship," Dion said. "We expect that we will not always see eye-to-eye with each other, but we need to make progress." China and Canada also agreed to disagree on the contentious issue of Beijing's behaviour in the South China Sea, Dion said. High seas geopolitical tensions in Asia and free trade aspirations hung over Wang's visit to Ottawa, which also included a talk with Prime Minister Justin Trudeau and his cabinet. Dion said he had "mature and respectful discussions on our respective positions on regional issues including the South China Sea." He said Wang was passionate, but so too are China's neighbours. Several countries in the region oppose China's assertive posture, with Japan particularly taking umbrage over Beijing's claims in the East China Sea. This is significant because the disputed waters also include important international shipping lanes. 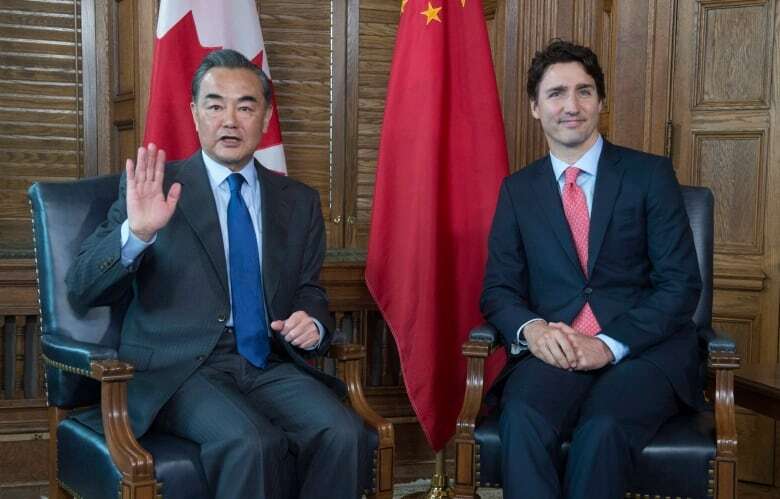 China wants to negotiate a free trade deal with Canada, but neither Wang nor Dion had anything new to announce on that front on Wednesday. Wang said he believes Canada and China are headed for a "new Golden Age" in relations, citing Pierre Trudeau's establishment of diplomatic relations with China in 1970 and gains made by former Liberal prime ministers Jean Chretien and Paul Martin. Wang made no mention of former Conservative prime minister Stephen Harper, whose near-decade in power started on a frosty note when he was accused of snubbing Beijing. Trudeau made positive strides with Chinese President Xi Jinping during his first round of international travel last fall. The Chinese leader praised the vision of Trudeau's father, Pierre, for establishing diplomatic relations with the People's Republic in 1970 during a meeting at the G20 in Turkey.